Celebrating the romantic lodges of past, a main lodge and guest cabins accommodate family members spread across the globe. With family members spread across the globe, the patriarch of the family wanted a home base that would give them all a chance to recreate, reconnect and relax over trips of a month or more. Each bedroom is a master suite, with fireplace, private balcony and adjoining children’s room, to ensure all generations have the space they need. Our shared approach was to celebrate the romantic lodges of the past, leading us to choose small round logs like those used in Old Faithful Lodge. 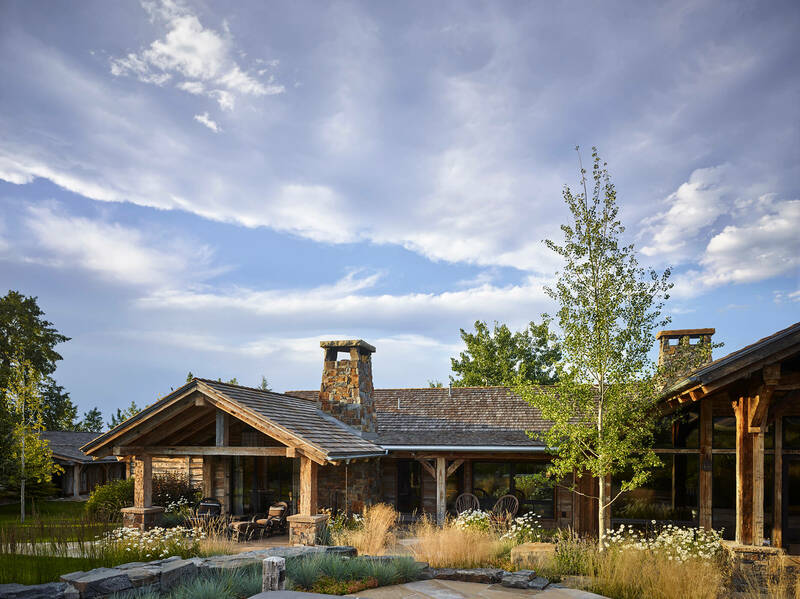 Like the Main Lodge, the Guest Cabins draw design inspiration from the classic log lodges of the West, integrating smaller round logs and native stone to convey a distinctive historic feel. The two 2000 square foot cabins are connected—essentially mirrored at the fireplace—each side boasting a master suite with fireplace, a second bedroom with bunks, a full kitchen, and living area.